Richard reads Fundsmith Equity Fund’s annual letter to fundholders and suggests a modest improvement that could change your perception of financial history. He also responds to reader’s queries about On The Beach, the company he profiled two weeks ago. If you are a fundholder in Fundsmith Equity Fund, then congratulations. You’ve just received fund manager Terry Smith’s annual letter, which, as usual, contains lots of insights for buy and hold investors including an explanation* of the fund’s investment in Facebook, a critique of old-school value investing, and an extended treatise on fund costs. If you have been a fundholder since launch, double congratulations. The letter will have told you that you are still making a lot of money. 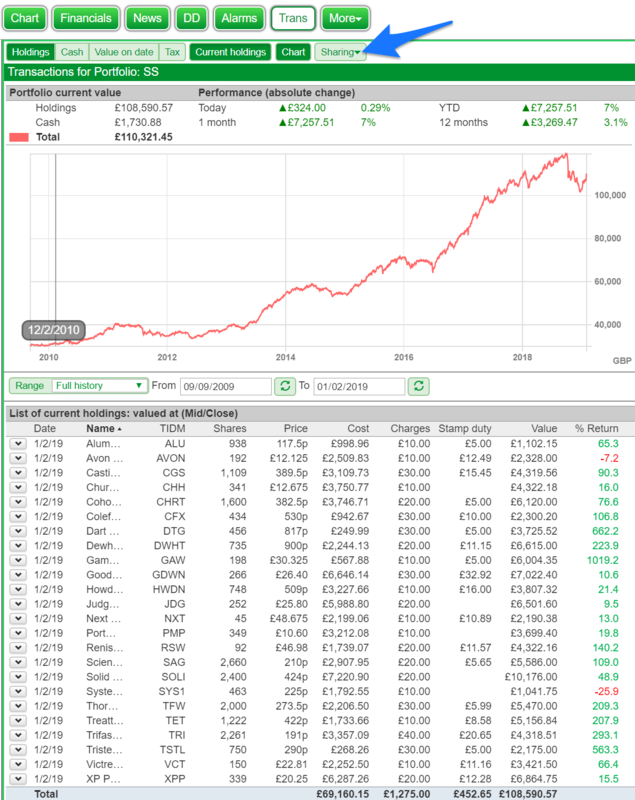 Despite a return of only 2.2% in 2018, Fundsmith Equity has made a cumulative total return of 297% and an annualised return of just over 17% between its launch in 2010 and the end of December 2018. Smith will reassure you that recent market jitters fell “well short of turmoil”, which is how the press described them. To put events in their perspective, he says his fund’s benchmark the MSCI World Index fell 5.4% in October, recovered a bit, and then fell 7.4% in December. In comparison, 21 years earlier in October 1987, the Dow, an index of leading US companies, fell 22.6% in a single day – the infamous Black Monday. You will. 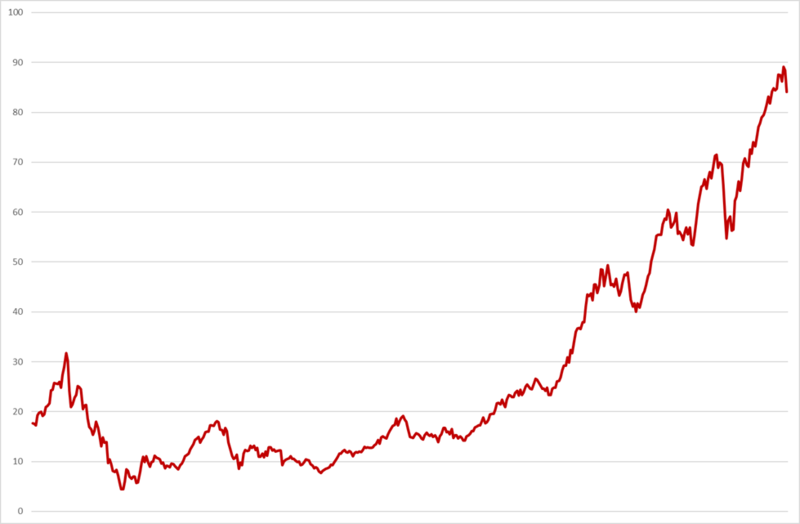 Black Monday is a tiny blip just as the chart begins to build momentum, surging up through the 1990’s technology bubble, then turmoil in the first decade of the 2000’s when the bubble burst and we experienced the financial crisis of 2008, another near vertical surge has followed (This is an index of US stocks remember). The implication, surely, is if you own good businesses, like Fundsmith does, you could have held them with confidence even through Black Monday. I agree, but there’s something wrong with that chart. Black Monday was a huge event so why does it look so feeble compared to more recent market movements? Even odder, The Dow fell almost 90% peak to trough after the Wall Street Crash of 1929 and it is almost invisible! Did people investing for most of the twentieth century really earn virtually nothing compared to people investing more recently? Far be it from me to suggest Fundsmith has used a chart that reduces the significance of past market moves to emphasise a point, but I reckon it has software that could have put events in their proper perspective. Now, the Wall Street Crash is revealed as the defining stockmarket event of the twentieth century. You will still have to look quite hard for Black Monday, but the sheer drop in 1987 is clearly visible and more recent events look less remarkable. Same index, so what is the difference? 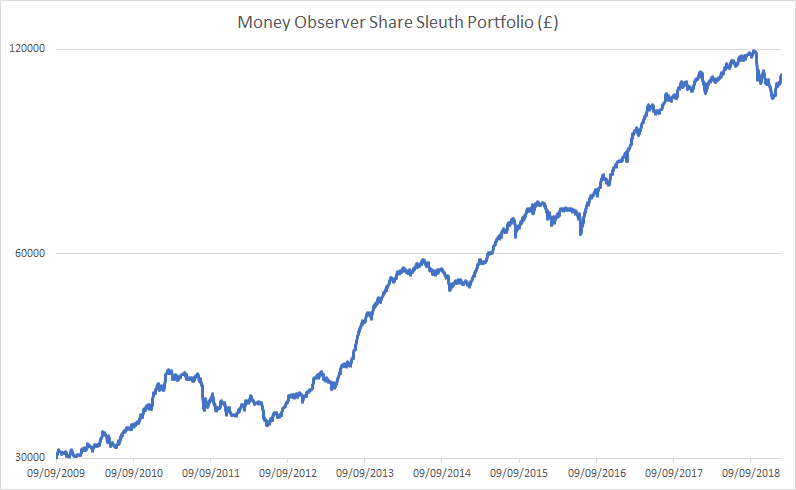 In SharePad’s chart, I have chosen to use a log scale on the vertical axis. In the first chart, Fundsmith used an arithmetic scale. On an arithmetic scale, equal distances represent equal amounts. Imagine we are back at school drawing a graph in our maths books. We decided each square of the paper is worth ten units. That is an arithmetic scale. On a log scale equal distances represent equal multiples. A change from one to two (a doubling, or increase of 100%) is the same as a change from two to four (also a doubling, or increase of 100%), four to eight, and so on. 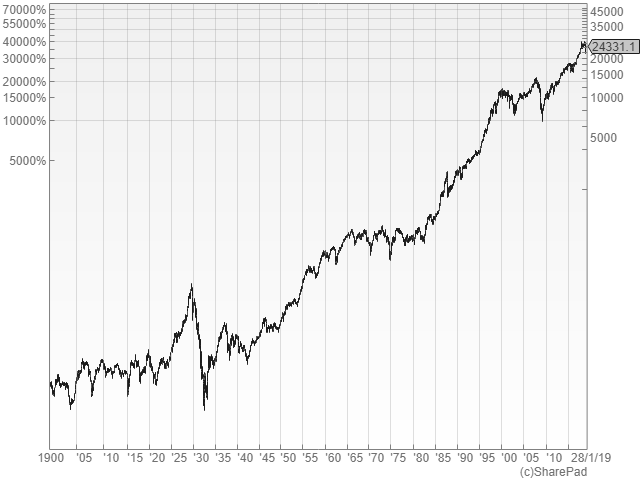 In the Fundsmith chart a 100 point move in the Dow in 1920 is scaled equally to a 100 point move in the Dow in 2019, even though, in round numbers, the Dow was at a level of about 200 in 1929 and today it is at 25,000. A 100 point decline in the index in 1929 meant it had halved, and a hypothetical investor lost half their wealth on paper. Ninety years later in 2019, a 100 point decline in the index loses our hypothetical investor just 0.4%. To make comparisons between market moves at different times, we need to represent multiples equally so a 50% change in 1929 is scaled the same as a 50% change in 2019. That is what a log scale gives us. One of the reasons log. charts were used less often than they should be before the advent of computers, was they are difficult to draw. When drawing them is as easy as clicking a button, that is not much of an excuse. Maybe you think I am just splitting hairs. Fundsmith’s chart is not wrong, it presents the same information a bit differently. Presentation is important though as Fundsmith goes on to demonstrate (inadvertently). Fundsmith deliberately left the dates off the chart because it wants us to think it leads up to now. 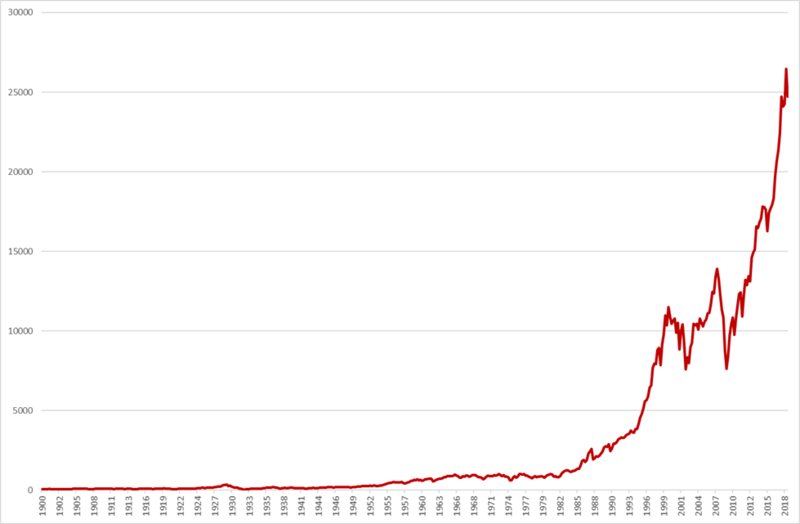 But the chart shows the 35 years up to 1965; the year Warren Buffett took control of Berkshire Hathaway, which he converted into the high-performing investment vehicle that made his name. Even though Berkshire Hathaway’s stock has suffered many setbacks since 1965 (notably 50% declines between 1973 and 1975 and 2008 and 2009), it was unambiguously a great investment to buy and hold in 1965, and so, the argument goes, Fundsmith Equity, an analogue for Berkshire Hathaway perhaps, might be now. Once again I agree. It would have been foolish to base the decision to invest in Berkshire Hathaway on the chart, but I humbly say I would not have done that. Like Smith, I am sceptical historical prices tell us much about the future, and if I were to glance at a chart, it would be a log chart. 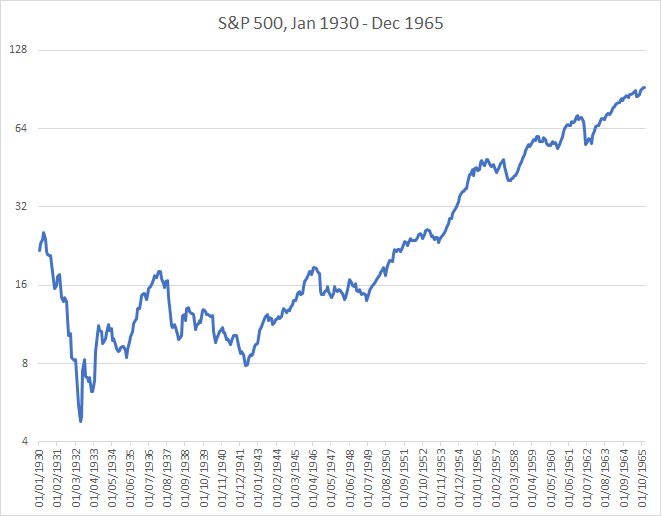 Admittedly we would have had to draw one in 1965, and we cannot use SharePad to draw one now as SharePad’s data for the S&P 500 does not go back far enough (it goes back 57 years though). The first decade or so, the Wall Street Crash, the Great Depression and the beginning of the Second World War, does look like a roller coaster. But the following 26 years look pretty benign to me. A quick note about On The Beach, the company I profiled in my last article. Readers have asked me about litigation from Ryanair that could stop the online travel agent selling package holidays using the airline. I explained the case in an article last year, but did not give an opinion because I am not a legal expert. However, as potential investors we can get a sense of the scale of the threat from On The Beach’s prospectus, the document issued in 2015 when it floated on the stockmarket. At that time, Ryanair flights accounted for just over 6% of On The Beach’s revenue. Ryanair has brought cases against other online travel agents including Germany’s eDreams and Expedia. Reading some of the trade press coverage gives me the impression Ryanair is not trying to prevent online travel agents buying flights, it is trying to shift the relationships onto its own terms. While victory for Ryanair would not be good news for On The Beach especially if it encouraged other airlines to follow suit, I am beginning to question whether it will make that much difference in the long-run. On The Beach is a very profitable business, perhaps it would continue to be even if it had to share more of that profit with airlines. 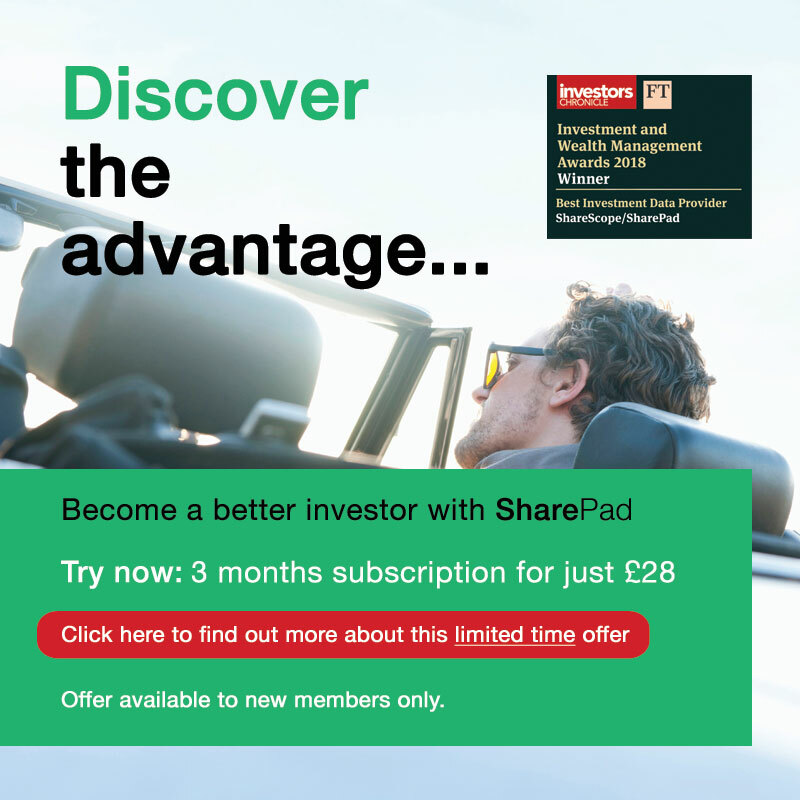 *Incidentally, a SharePad user has analysed Fundsmith’s Facebook acquisition, you can read it here.